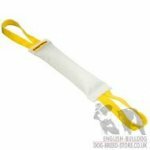 Collar width is one of the main characteristics you need to draw attention to when choose English Bulldog dog collar. Dog collar width is of different kinds. The most common are 0.9 inch (20 mm) and 1.5 inch (40 mm). Which collar width to get for your Bulldog? Let's find out. 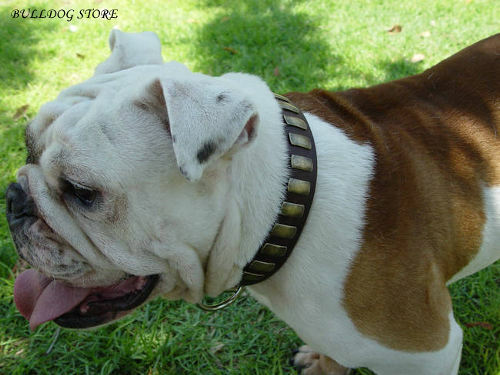 Dog collar width choosing depends on Bulldog's activity, character, age and size. The larger your dog is, the wider collar is chosen. Big and strong Bulldogs need wide collars. Narrow collars are for puppies and medium Bulldogs. Remember that extra wide collars (wider 1.5 inch) are for large and powerful Bulldogs. Thin collars won't suit active Bulldogs, which pull on the leash because they can hurt them and tear under the influence of their power. If you have a Bulldog puppy, the collar of narrow width will be suitable. Puppy's neck is tender and the collar won't traumatize it and will cause no discomfort. The collar width is changed while Bulldog's growth. Narrow collar is of light weight. It doesn't cut into the dog's skin or rub it. Thus the collar is safe for your little Bulldog. The puppy will feel comfy during daily outings with this collar on. 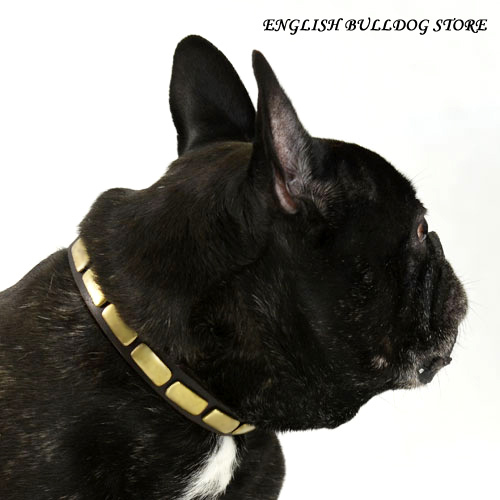 Thin collars are suitable also for French Bulldogs, young and adult English and American Bulldogs walking. It should be mentioned that these collars are allowed for calm and well trained dogs, which are fully obedient and their owners are absolutely sure that they won't show aggression in unforeseen situation. Wide collars serve for middle and large-sized Bulldogs. They are intended for everyday use. The main function of these collars is Bulldog control. 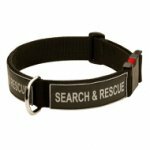 Wide collars are durable, hard-wearing and tearproof. The wideness of the collar is optimal to control strong Bulldog reliably and not to do any harm to the dog. 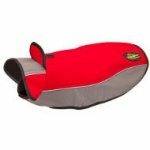 Your Bulldog will feel comfort and you will handle it confidently with such a collar on. Both collars are usable and suited for Bulldogs. It depends on your dog's age and size which one to choose.